Who came to the big event? An Ohio Stadium’s worth of people. Here are snapshots of some of them. Video of Farm Science Review 2018! They came, they saw, they discovered, they tried to stay hydrated. 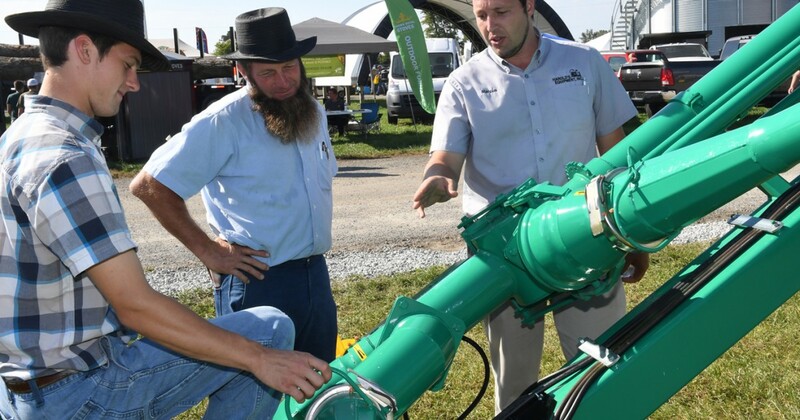 More than 600 exhibitors from CFAES and industry showcased their latest new research and equipment. In all, some 108,074 people attended — farmers, gardeners, teachers, students, business owners, families and their friends. Here are snapshots of some of them. Curtis, from Chicago, practiced urban farming in high school. He’s now a senior majoring in agricultural sciences at Ohio’s Central State University in Wilberforce, about 30 miles southwest of London. His first-time visit to the Review was made with some of his classmates from Central State, all of them studying agricultural education. “I’m just really excited to explore more and represent my university, a land-grant university,” he said. Hillard brought a crew along with her: 89 students and chaperones from Northwest High School in Springfield, where she works as an agricultural education instructor. “We’re helping with a school garden for our multi-handicap unit,” she said. The students explored the Review, including its Utzinger Memorial Garden, to get ideas for plants for their garden. For now, it grows carrots, peas and lettuce. But the students are planning to develop it further to turn it into an outdoor classroom. Morgan’s business is farming. He raises corn, soybeans, wheat, hay, cows, chickens and sheep in Fairborn near Dayton. He comes to the Review to find new ways to keep his business running well. “I want to see what’s new and what’s available for sale that will help me out,” he said. Ronald and Julie Landes and their sons Marcus and Titus produce cattle, hogs, chickens, wheat, corn and soybeans in Eaton, west of Dayton. Julie said they come to the Review to learn about new products and practices, including related to practical matters such as managing manure odors. Her family likes “any booth that has to do with our farm,” she said. Streng gave two reasons for attending the Review. “I’m here to keep up with all the technology in the farm industry, and also to get out of the house.” At home in Plain City in central Ohio, he grows sunflowers, tomatoes and squash in his garden. He enjoys people-watching at the Review. “It’s like a walking sideshow,” he said with a laugh. Find details on Farm Science Review on its website. See previous years’ photos on its Flickr site. Planning ahead? Next year’s Review is set for Sept. 17-19.